Your site gets optimized for mobile view when you publish it. Visitors of your site that use a phone or tablet will see a mobile-friendly version. If mobile view is deactivated, your visitors will always see the desktop version, regardless of the device they are using. We recommend that you keep mobile view enabled because it improves your SEO ranking, and it is more user-friendly for visitors accessing your site on a mobile device. Remember that you need to republish your site, to enjoy the latest mobile view optimizations. Where can I activate it? 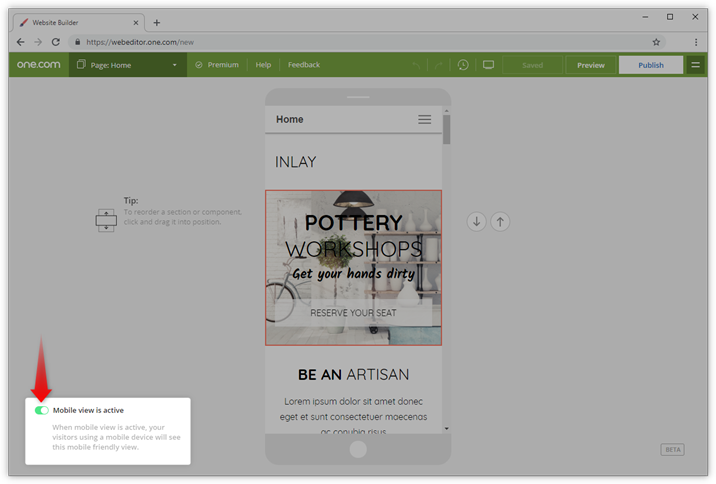 You can manage mobile view from the Mobile view editor and the Mobile preview screen. In both cases, you can find a toggle to enable or disable it in the bottom left corner. How do I optimize my Website Builder site for mobile?